Reading the reviews for this film on Amazon is a kick. Nine 1-star reviews, and one 5-star review. Clearly one out of ten people were previously familiar with Herzog's work! Having watched the film, I get it, but everybody's being hyperbolic. 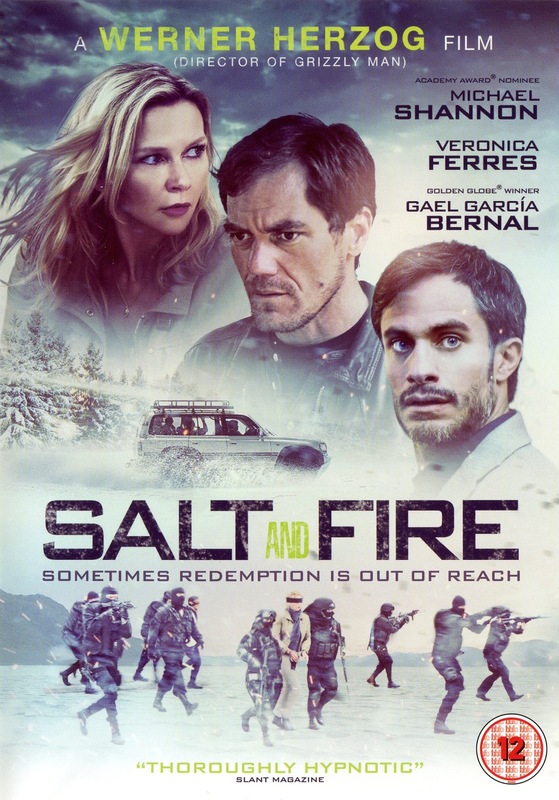 People going to Salt and Fire expecting some kind of conventional action thriller like the cover suggests are headed for some real disappointment. Yes, it starts out that way. Three ecologists working for the UN arrive in Bolivia only to be promptly kidnapped by terrorists. The early scenes of them stuck waiting in a foreign airport after it's emptied out and we know things can only be bad are genuinely creepy and unnerving. Like if The Langoliers was good. But all that soon drops away, and it becomes pure Herzog, and with a preachy environmental message to boot. But pure Herzog is far from a bad thing. He goes out of his way to find wild landscapes and environments nobody's ever put on film before. He masterfully blends music and editing to create beautiful scenes. It's just that, unfortunately for conventional film-goers, the plot stops being a priority. The lead terrorist, Michael Shannon (Zod from Man of Steel) removes his ski-mask to debate philosophy with his captive, and they get side-tracked into a discussion on art. And for a few minutes, the film becomes a documentary on anamorphic art. A good little documentary, but for anybody expecting a daring, violent escape or something, well, I guess they get angry and leave 1-star reviews. But that's just reactionary nonsense. Just mounting this production in these stunning locations, particularly a strange island surrounded by a horizonless salt lake, alone has to raise it above Manos: The Hands of Fate or Red Zone Cuba level fare. Anybody who can't recognize that is just being disingenuous. But it's also not a perfect 5-star movie. He brings more than enough of himself to please his devoted fans, but as is often the case in Herzog's fiction films, some of the line deliveries can get a little clunky. Worse, the message of the film gets firmly in the way of the drama, leaving us with a downright frustrating ending. Although, to be fair, this is an adaptation of a story called Aral by journalist Tom Bissell, and reading through it online, it's surprisingly faithful. All the dialogue is practically word-for-word accurate, except the film is so short, Herzog has to extrapolate and add a lot of additional content. But those additions aren't really the problem. The original story just isn't a dramatic one and doesn't try to be. It's more of an essay on ecological disparity with some narrative trappings. So Herzog successfully made the film he set out to make, but it just so happens to be the sort of thing that only 1 out of 10 people set out to see. So, you actually have a couple of options with Salt and Fire, but the distinction's almost completely immaterial. There's a German DVD from Indigo, a French DVD from Potemkine and the one I chose, the UK DVD from Matchbox Films. All three are barebones, widescreen releases, released between mid-April and this week. The film's shot in English, so language-wise it shouldn't matter what you go with. I'd say just get whichever you can find for the cheapest. The film is presented in anamorphic 2.35:1, and looks pretty good (it is a new release, after all), except soft. But that's SD for you. A film with a look like this really ought to be seen in HD, but c'est la vie. Even for SD, in fact, I think it looks a little soft; but that could be because the camera is in perpetual motion, so it never quite settles on a perfectly sharp image. But still, a blu would look better. But it's not interlaced or otherwise troubled. We're given the option between a 5.1 mix and basic stereo (which sound pretty similar to my ears), with no subtitle options. There are no special features, which is a shame, since Herzog's usually pretty good about providing commentaries or interviews to his stuff. All we get here is the trailer. So do I recommend this film? If you're a Herzog fan, sure. His work is always at least interesting in various aspects. And it's a cheap DVD, so there's no reason for this to be the one that makes your collection incomplete. I'm glad to have gotten my copy. But if you're not already carrying your fan club membership card, this is definitely not a Herzog movie to start your explorations with. John, what's up with a comparison for the different releases of Aguirre, the Wrath of God? Not only is it Herzog's greatest film, it's one of the greatest films of all time, period. Hmmm... maybe one of these days. I've got a couple other Herzog titles in my sites for upcoming coverage first, though. But I'm definitely a fan of the film.